A third (33%) of Americans say there are guns, rifles or pistols in their home, which is little changed from recent surveys. More than twice as many gun owners (65%) as those who do not own guns (30%) say it is more important to protect gun rights than to control gun ownership. (When it comes to the public as a whole, 51% of Americans say it is more important to control gun ownership, while 45% say it is more important to protect gun rights). 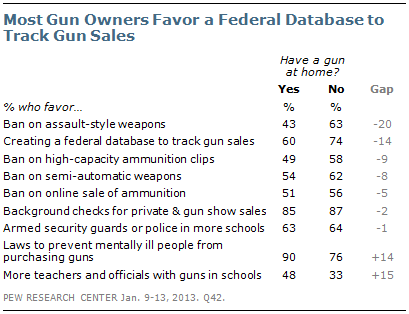 While gun owners, unlike the public at large, oppose gun control measures such as banning assault-style weapons, a big majority of gun owners (85%) support making private gun sales and sales at gun shows subject to background checks. That matches the level of support among the general public for doing this.